Mix Juice Strawberry and Lime is a blend of ripe Strawberries and Zesty Limes that tastes a lot like gummy strawberry sweets or Strawberry Laces. A sweet, fruit e-liquid perfect for all day vaping. 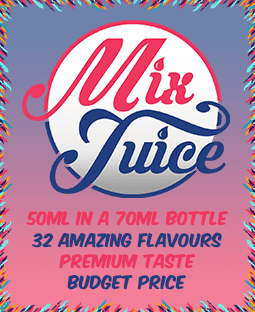 You can buy your Mix Juice Strawberry & Lime e-liquid on its own, nicotine free or you can add 10ml or 20ml or Nic Shot to create your desired strength.